Miso Crafty Knits: PURPLE Success! 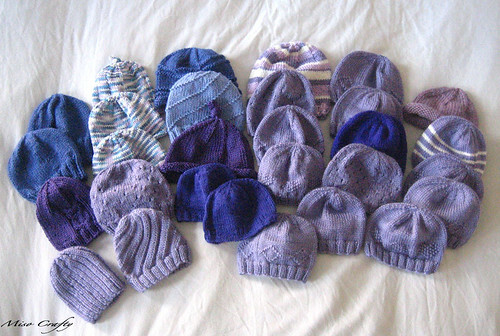 My knit-in for the Make Your Mark Purple Crying Cap Campaign on Sunday, October 24th was a success! Thank you so much for those who volunteered their time and knitted up a hat or two (or three in some cases, right Jennifer?) for a very good cause. I was seriously banking on only having maybe 3 or 4 people show up, so imagine my surprise when there was seven of us knitting away on these sweet little baby hats!! I hope the others had as much fun as I did. Yes, the seats could've been a little more comfy considering that some of us had sat and knitted for 6 hours straight. But other than that, it felt like a regular knit night except we were all knitting away with purple yarn, making a difference. At the end of it all, as I was packing up those dear li'l hats to send off to BC Children's Hospital, I had counted 30 hats!! The above photo only shows 29 (for those who are counting! ), I had a last minute addition an hour before I taped up the box. I'll also be applying for the Make Your Mark grant on behalf of our efforts and am really hoping that $400 will be making its way to Prevent Shaken Baby Syndrome BC. So a huge, huge, HUGE thank you to Jennifer, Wendy, Nancy, Megan, Carolyn, Michelle, and Kanista! Thank you so much ladies for everything!! Great work! What a lovely way to donate to a good cause. The hats all look fantastic. Thanks for organizing, and sharing a photo of all the hats. I had fun and it felt really good to knit those hats. Thank you! If really does feel much better to actually dig in and "get your hands dirty" rather than writing out a check. I can't wait to do this again next year! No, THANK YOU for coming out and knitting some hats for this cause! I really wish I could make it to the Tuesday knitting group cause I don't get to see you enough!